When making store clothes it is important to consider such factors as the class of the future store, the type and style of clothes you are going to sell and what the size of the trading floor. The combination of these details will play a crucial role in the choice of equipment, and well-designed interiors will guarantee a successful business. For each type of shop provides for certain commercial equipment. Properly organized space is the first step on the path that the visitor will become your customer. For all types of stores, there are General rules. In the trading room it is important to distinguish several zones, each of which will contain a particular product. To support the new collections and the most expensive and fashionable things. In the second zone place everyday and less expensive items, in the third zone imagine youth clothing. And don't forget an important detail – the clothes of different types must not be mixed. Based on the fact that the majority of buyers, once in the store, intuitively turn right and move along the right wall, organize the first zone so that it started at the entrance and goes to the right. Statistics show that near the entrance is made more than 60% of purchases. Regarding security, it is very important to plan the space so that it is viewed by the administrator and the security officer. The changing rooms need to be placed on the sides or at the end of the hall, so they did not take the trade room and had a comfortable approach. They should have good lighting and sufficient space for personal belongings of the buyer. If you open the boutique, which will sell branded clothing, emphasize the exclusivity of the product and the interior, which will be presented clothes. You all should be expensive – repairs, equipment and every detail. You do not need a lot of commercial furniture. Importantly, the store had plenty of space and good lighting. Don't forget to buy a couple of sofas for the customers. 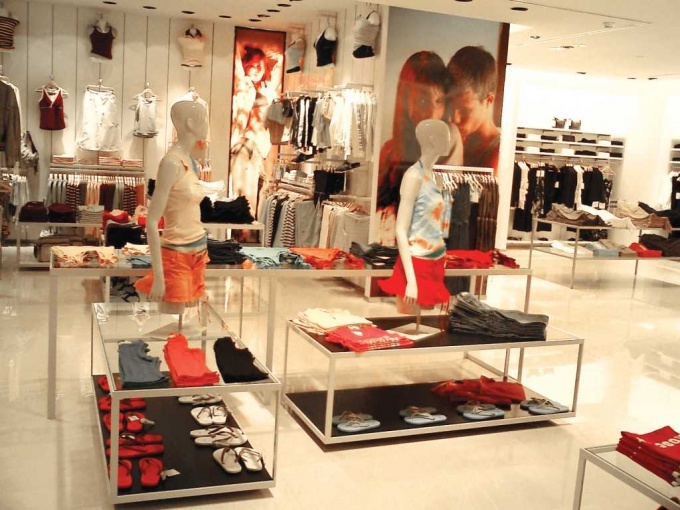 For large clothing stores, the main rule of effective placement of equipment is convenient access to the goods. It is important that the buyer be able at a glance to cover a large amount of clothing. All items must be neatly hung and folded. In stock shop, you need to create a functional trading floor, where it will cheap equipment, accommodating a large number of things. The style of the franchise stores – total for all countries. Therefore, in this case, you will have to adhere to certain design rules. The trading equipment should facilitate the ease of selection. For example, shirts must be placed on the shelves with storage below the lid was a sample, and at the drive – goods of all sizes. Jeans made to put on the shelf with the bins or on the tables. They must be instances of the models, so the buyer was convenient to consider the item. Keep in mind that the sale of the goods largely depend on its placement. The same thing can be on different shelves, and this factor will determine the level of sales. The most effective shelves are at the level of hand eye. Shelves at other levels is ineffective from the point of view of sales. There is one subtlety. Mannequins – the most famous way to attract the attention of the buyer. Basically, they are exhibited in glass-cases, but with proper use of space, for them to allocate space in the sales area. Well-chosen outfit on a mannequin can help to ensure that the buyer will try and acquire a whole set at once. They are convenient in that they allow to evaluate a particular outfit on a figure and how you can combine things from the collection. In clothing store a very important role lighting plays. Therefore, pay special attention to the light. In addition to traditional overhead lighting, use lighting, lamps, and other items. Clever lighting will add a special charm to the shop and make finding it comfortable. Market women's clothing today is saturated. In conditions of tough competition, business owners should use a comprehensive approach to attract buyers. The correct clearance store women's clothing is an important factor that allows you to attract customers. Decide the concept of your store. The design must fit the positioning of your brand. For example, a boutique with clothes for the business woman should not look pretentious and pompous, and shop evening dresses, in contrast, requires the creation of a solemn atmosphere. If the budget allows, resort to the services of a professional designer. Regardless of the style sold clothes and budget, you can arrange the store in a universal way. Give preference to clear lines and strict proportions. At the same time try to smooth things over and avoid so-called "spatial maze", which will block the consumer thread. Try to divide the sales area into zones in accordance with the collections of clothing, for example, "sweaters on the shelves", "clothes on the brackets, accessory at the front". These zones can be identified by different shades of the same color leading. If you sell under one brand name several lines (youth, casual, etc. ), choose a single color, but to distinguish collections use different decor. For example, in the area of clothing for young people, add bright posters or lamps in a futuristic style. Use in the design of the store no more than three colors, with the give preference to pastel shades. Such colors will visually expand and ennoble the space. Try not to overload trade area with unnecessary decoration because it will distract the attention from the clothes. Consider lighting solutions. Lighting should be focused on brackets and shelves, so that the buyer can adequately assess the color scheme of clothing. It is highly effectively in the sales area looks area offices with light: it becomes the visual center of a space about which to be pleased. The best Windows are mannequins with selected images. Try to combine them to more clothes: buyers may want to buy all the components shown in the window image. In the trading room will also place the mannequins to the clients saw the finished stylistic decisions. Pay special attention to cleanliness. Even the most luxurious decor will never save the situation, if the store is a dirty floor, dusty shelves or showcases in divorce. Pay attention to the details that create a pleasant atmosphere in the store. Turn on some good music, put sofas, vases of candy, take care of the pleasant smell with the help of special aerosols for the stores. These little things will cause buyers to linger in the store as long as possible.